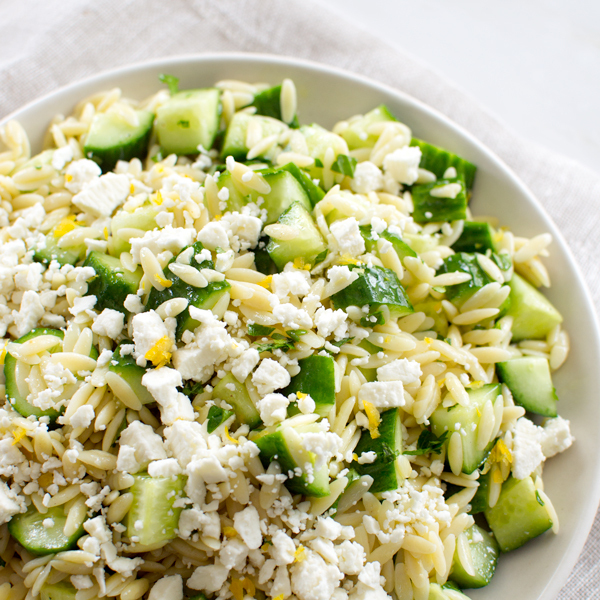 Simple and delicious recipe for Orzo Pasta Salad with Cucumber and Feta, a refreshing summer side dish. Bring a large pot of salted water to a boil. Cook the orzo al dente according to package directions (about 9 minutes). Drain the pasta, let cool for a couple of minutes, and toss with the olive oil, lemon juice and zest, cucumber, herbs and feta. Season with salt and pepper, to taste. Serve chilled or at room-temperature. Can be made up to a day in advance and kept in the refrigerator.